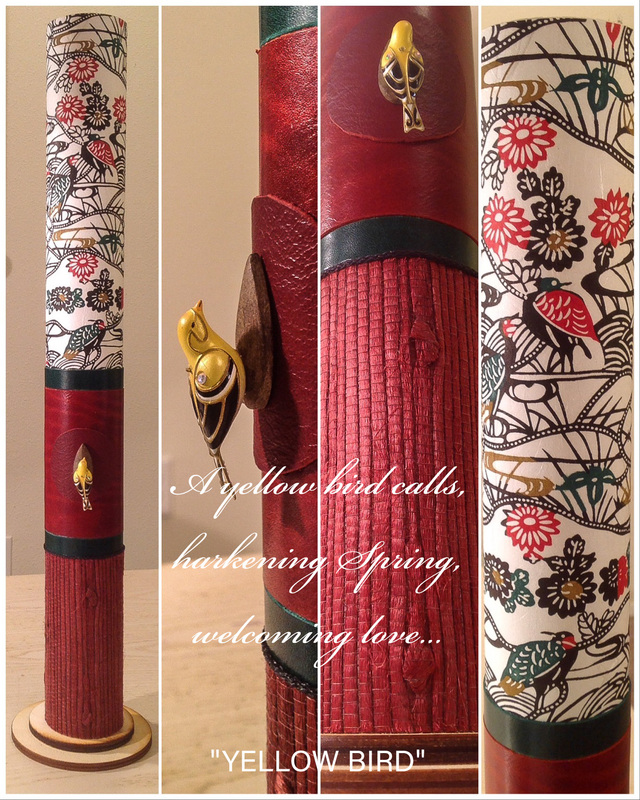 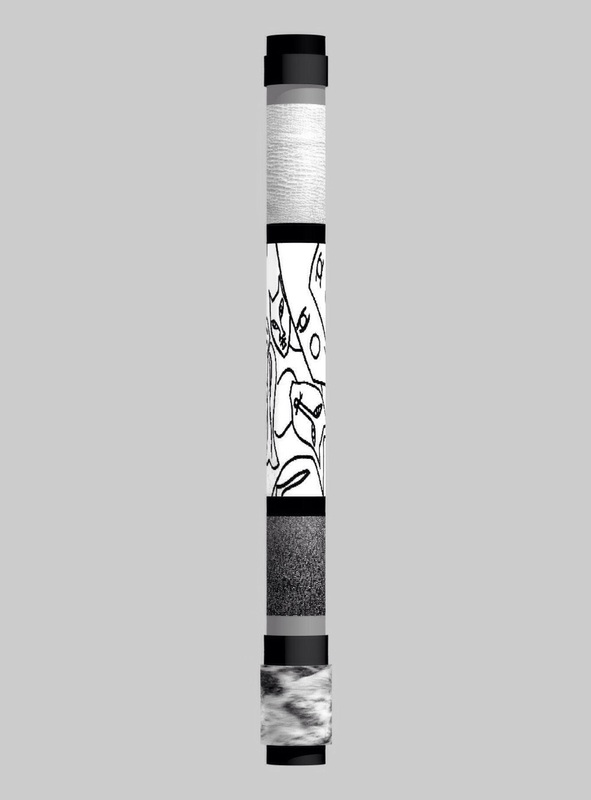 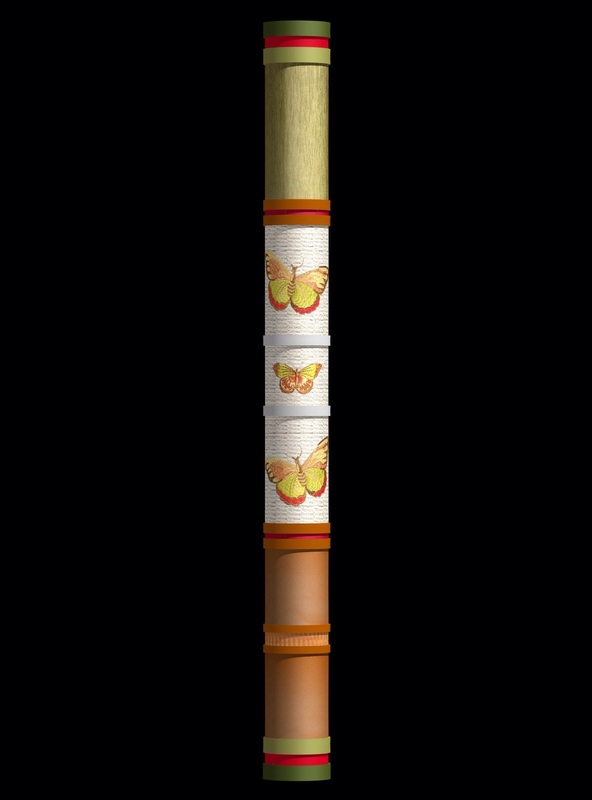 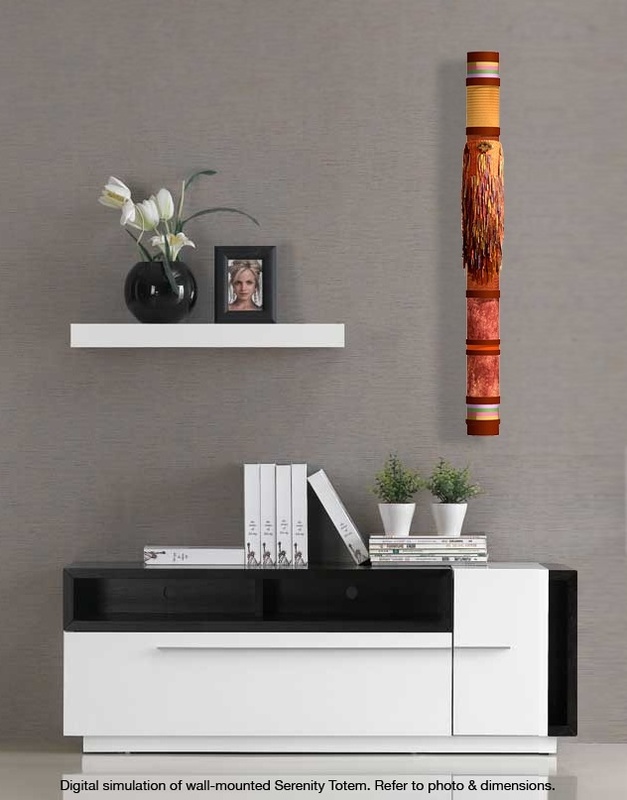 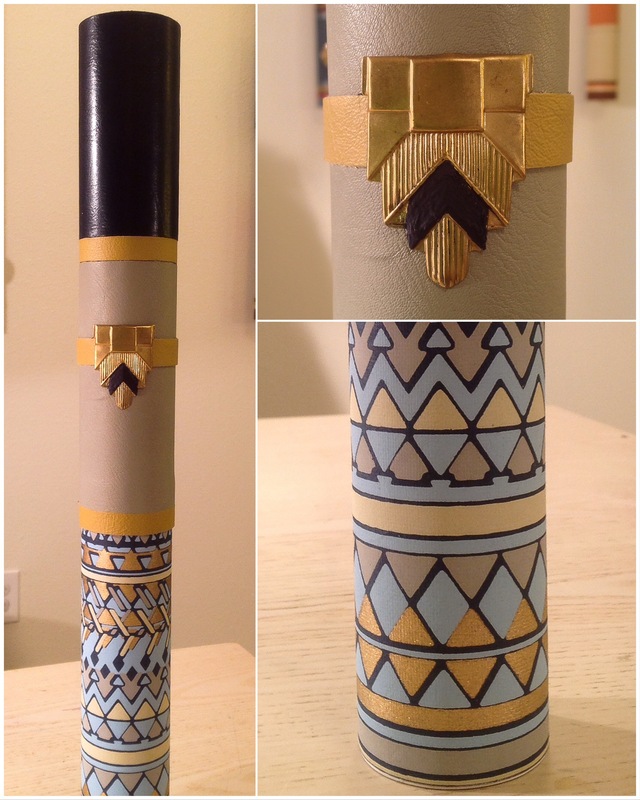 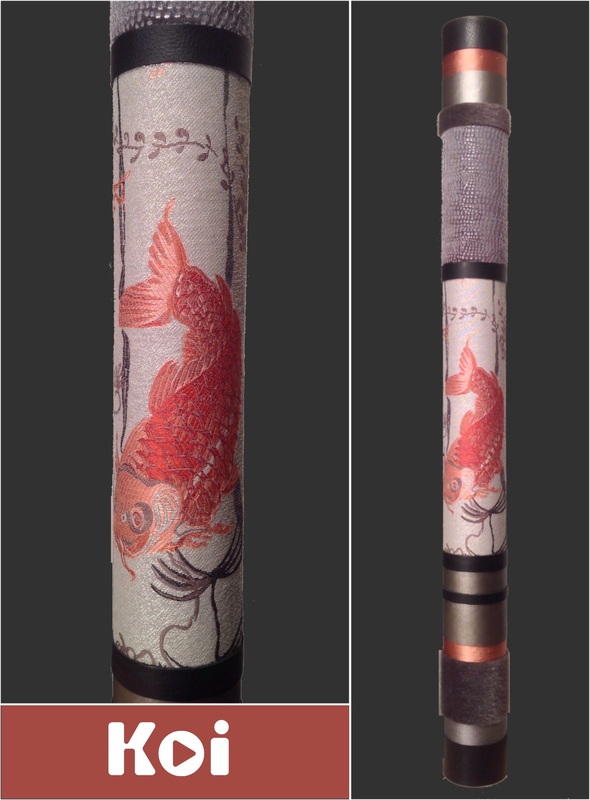 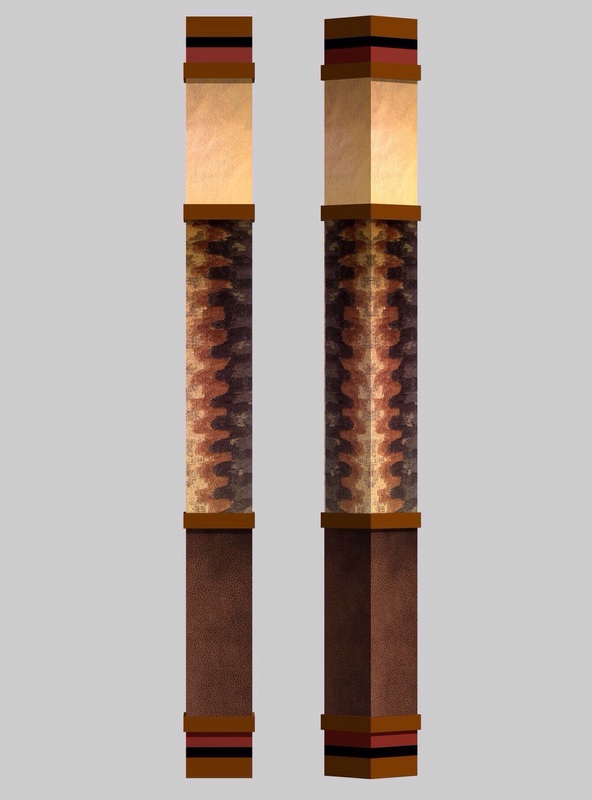 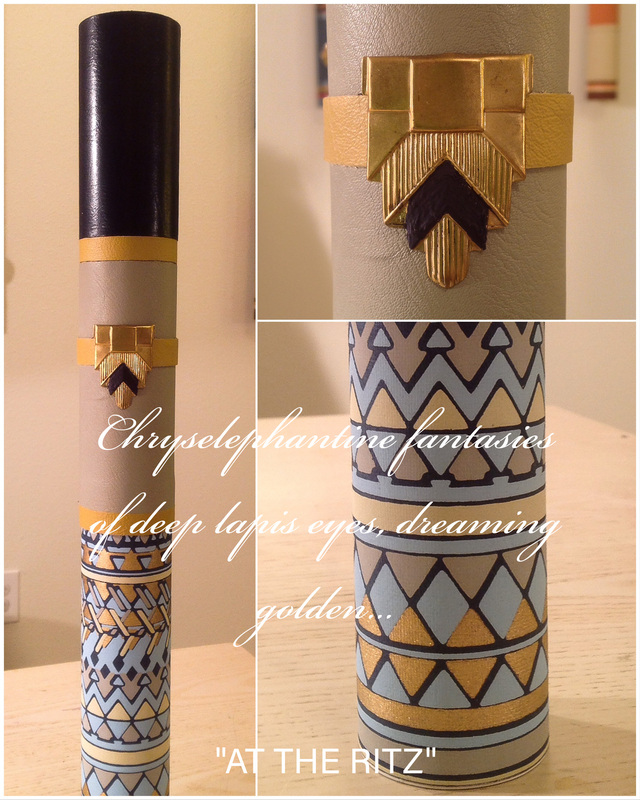 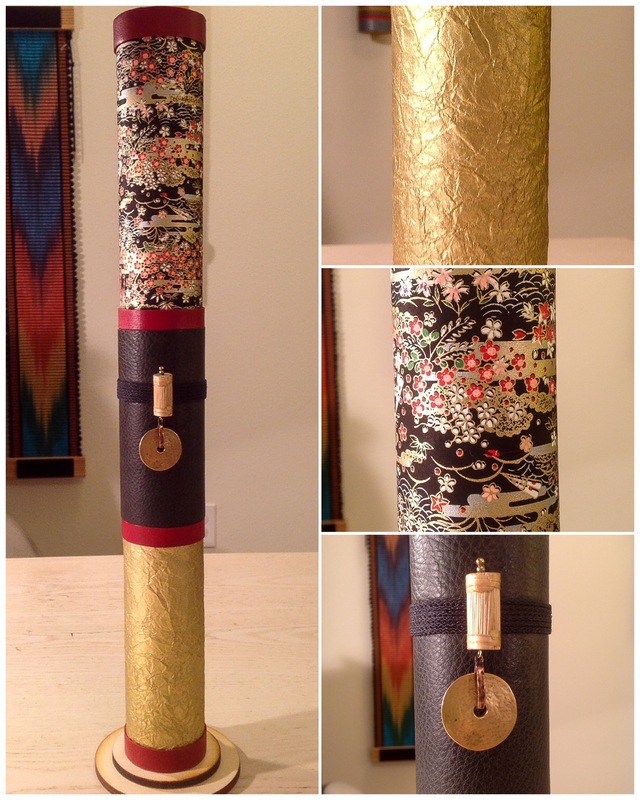 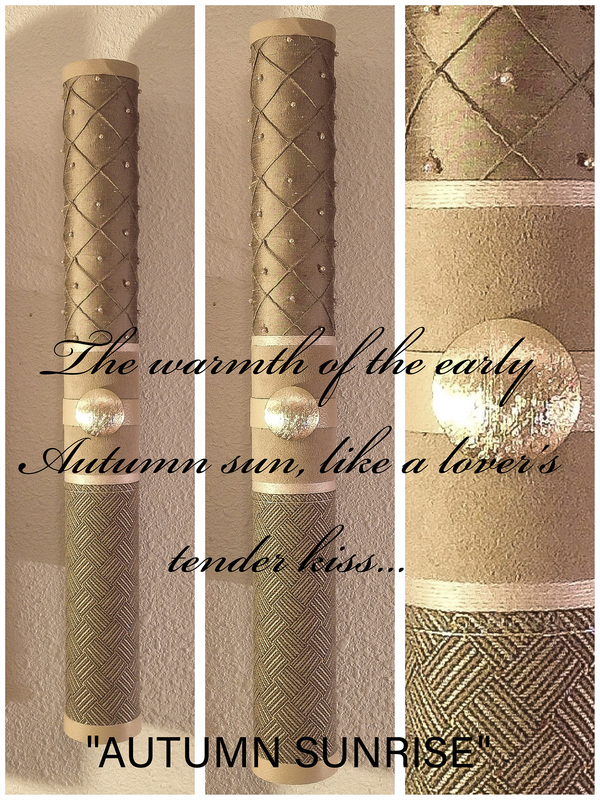 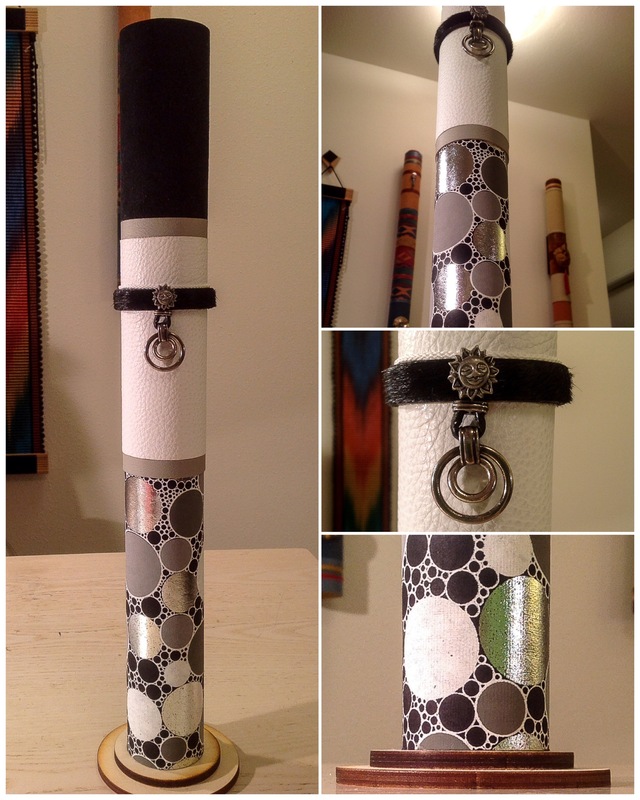 These are my most recent “Verses Group” of the Athena Series, an important element of my expanding Serenity Totems… They are cylindrical, measuring 19″T x 2.25″D. 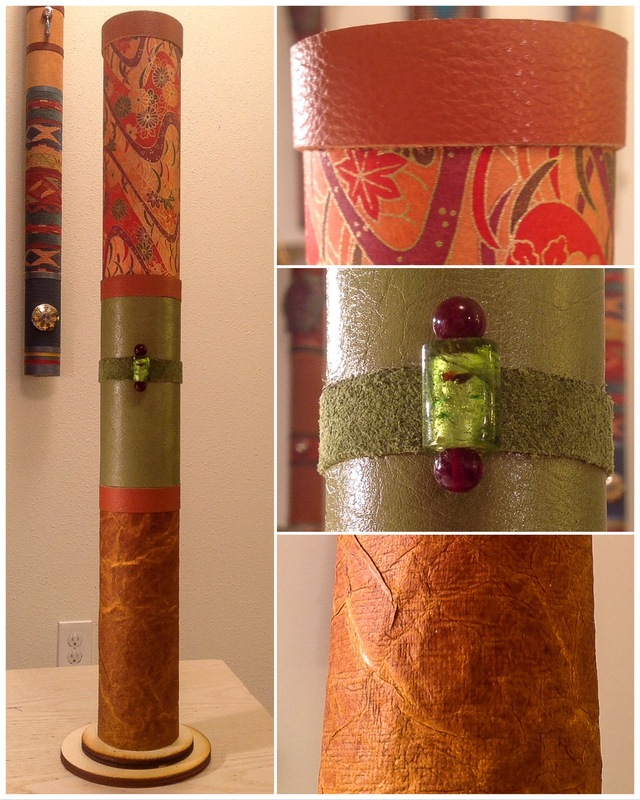 They feature any combination of up-cycled Couture fabric and leather remnants, imported hand-silkscreened Chiyogami Yuzen fiber stock, mercerized fiber windings, and Talisman accents I hand-assemble from random bits and pieces of “found objects”; especially discarded jewelry and watch elements. 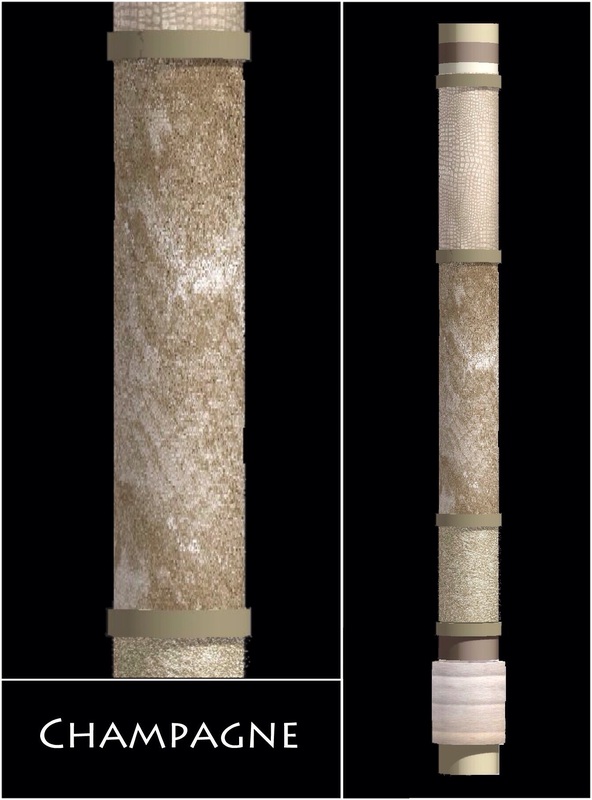 They are each mounted on strong, spiral-bound, hard-coated, fiberboard tubes. They can easily be displayed on any perpendicular surface via their integrated wallmount, or on any horizontal surface using their optional tabletop stand (pictured 3rd image down). 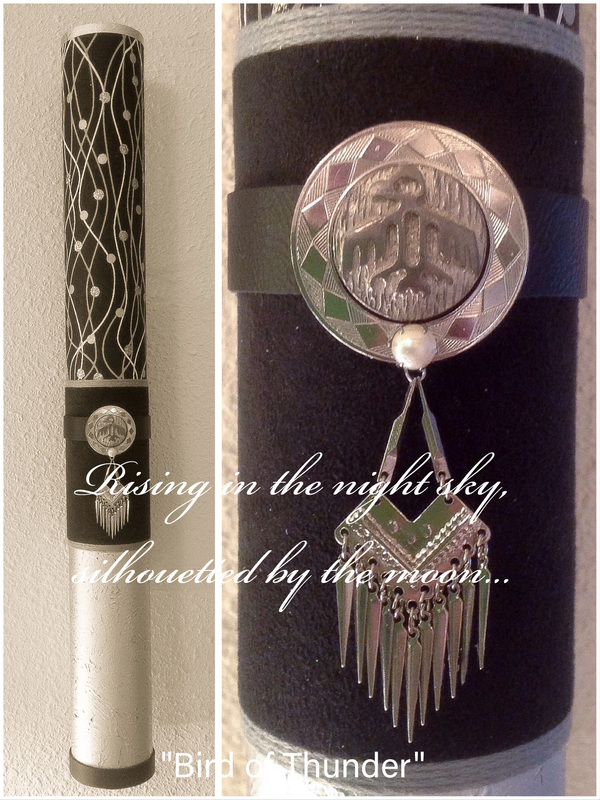 NOTE: Quite a few of the following pieces have been sold or gifted over the years. 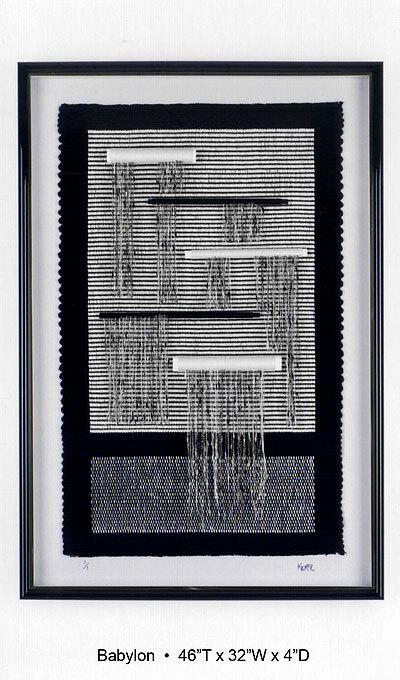 The first two pieces are entitled “Yin Yang” and “Fallingwater”, followed immediately by a description of the methods, materials, processes, and creative tools employed in their creation. 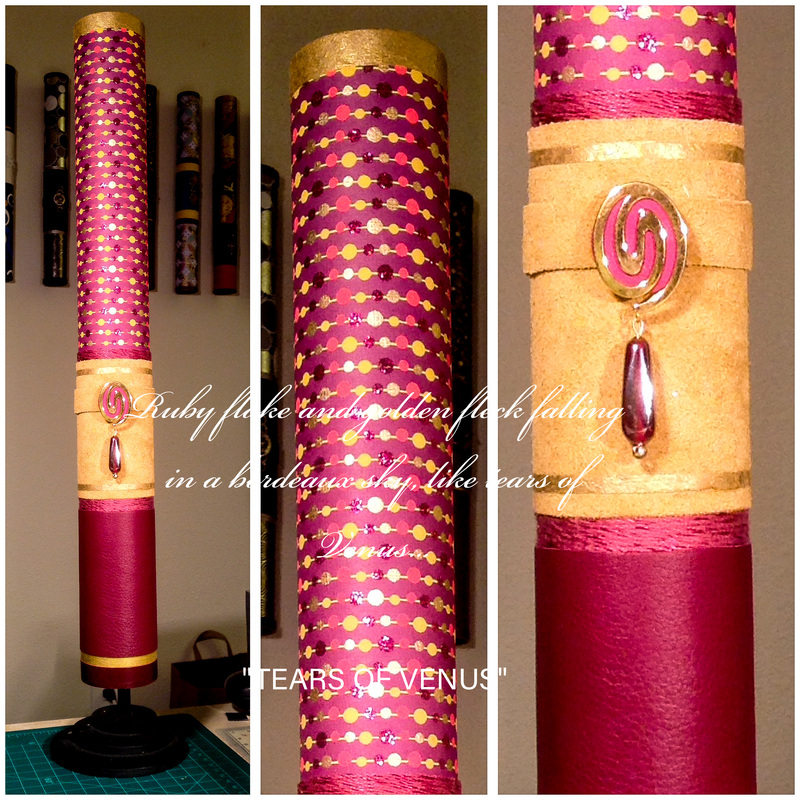 More examples of Fibrations Studio work can be found below that. 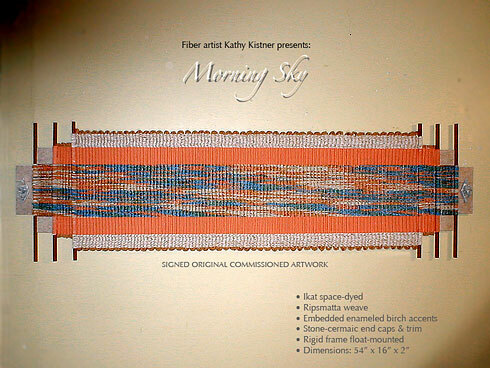 Kathy utilizes spinning, dying, weaving, sculpting, braiding, cording, dowel wrapping, other creative fiber techniques. 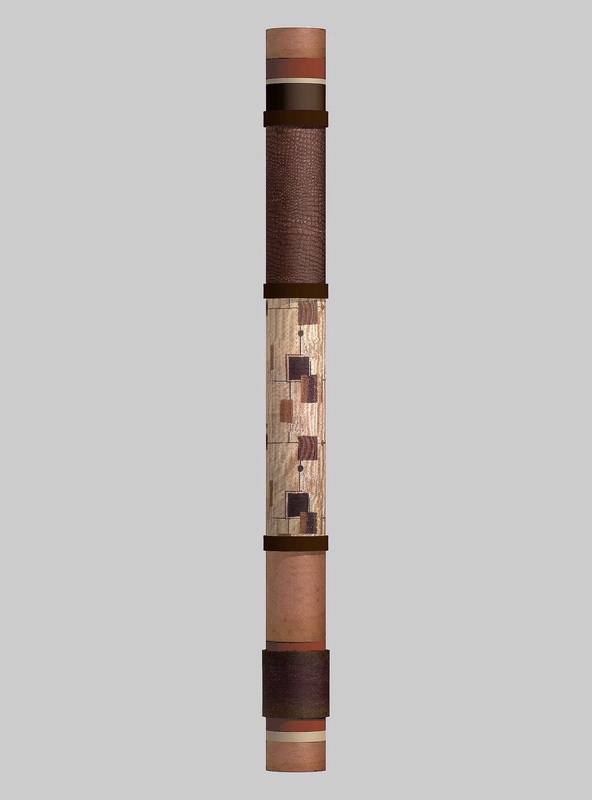 Rob is also involved in dowel wrapping, as well as designing and assembling wood accent elements, in addition to fabricating rigid mounting substructures. 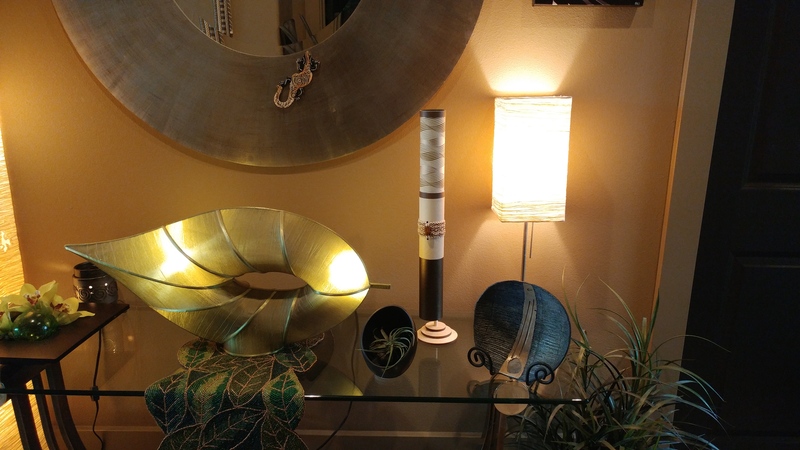 They call their studio Fibrations™ because of the positive vibrations their mixed media fiber creations create for those who view them. 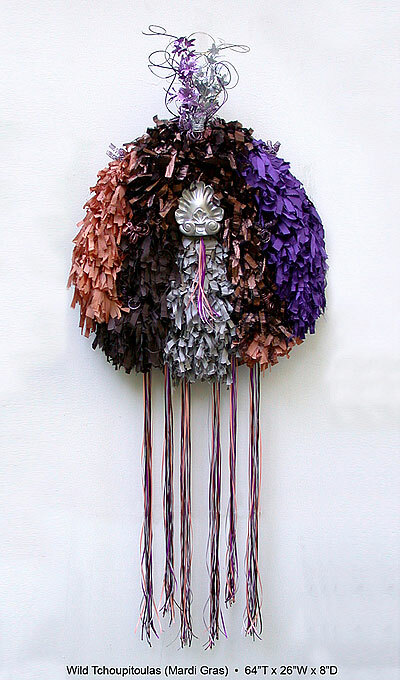 It is a plethora of spinning wheels, dye pots, warpping boards, floor/upright/lap looms, hoards of hanging skeins, drawers and shelves of “found objects”, electric saws, glue pots, paints and brushes, and multiple semi-cluttered assembly tables with pieces in varying stages of completion. 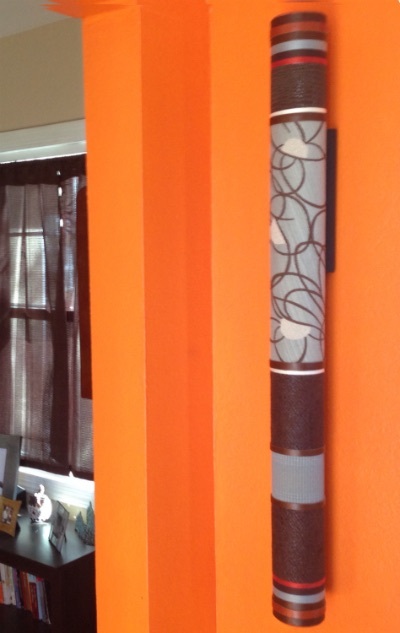 Together they envision the designs, Kathy creates the core magic, and husband Rob helps with accents and structural mounting. NOTE: Each Serenity Totem is approximately 37″ in length with an outside diameter of approximately 4″ – not counting any surface appliqués. 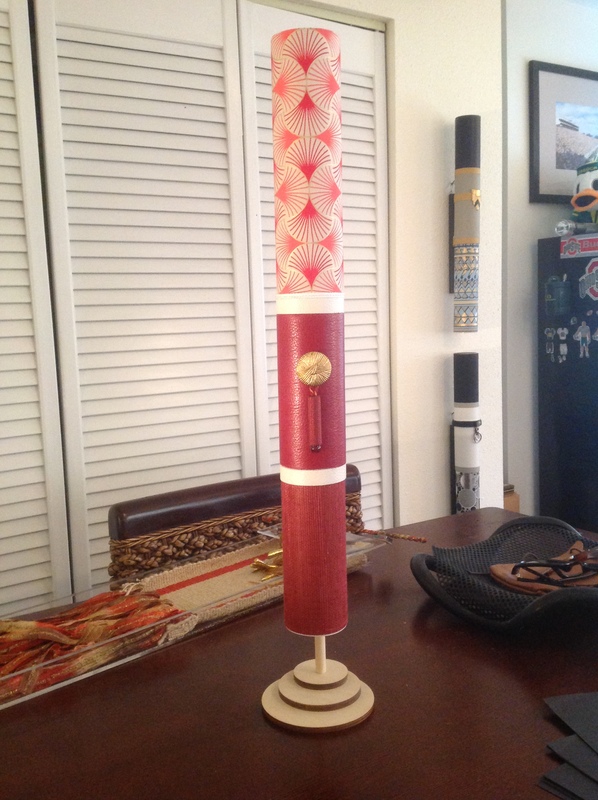 Jeni & Kathy demonstrate the Serenity Totem’s relative size. Serenity Totems look incredible float-mounted in the home! 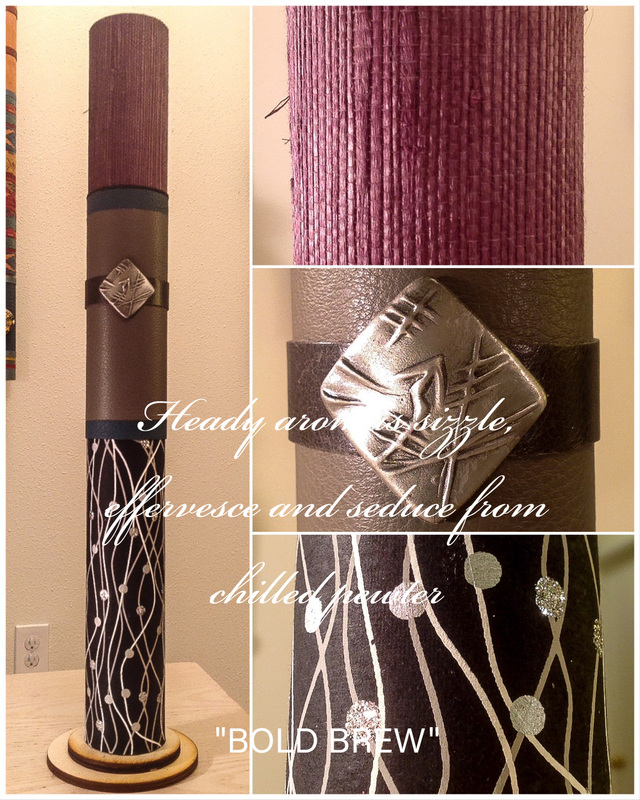 The following pieces are from our ‘Handwoven’ Serenity Totem Series. 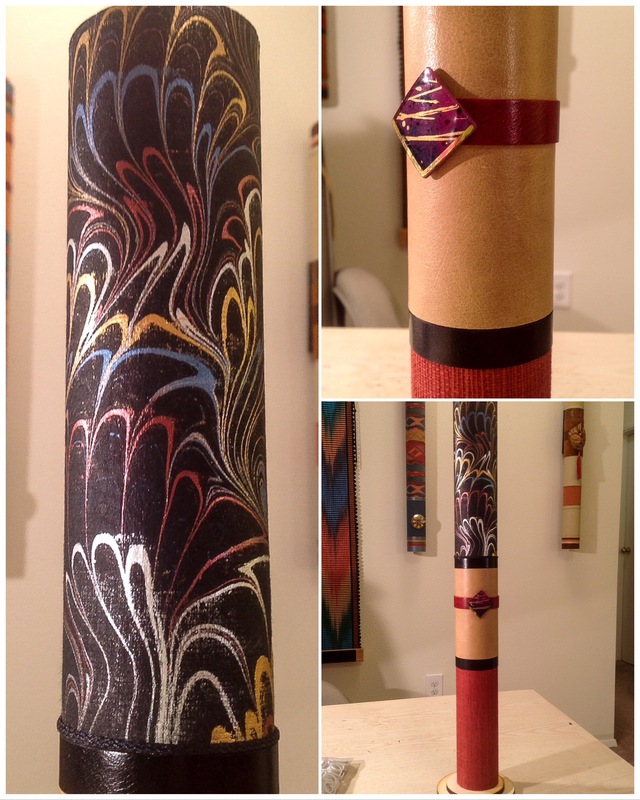 Each is a contemporary, one-of-a-kind, cylindrical, 3D, mixed-media fiberart sculpture. 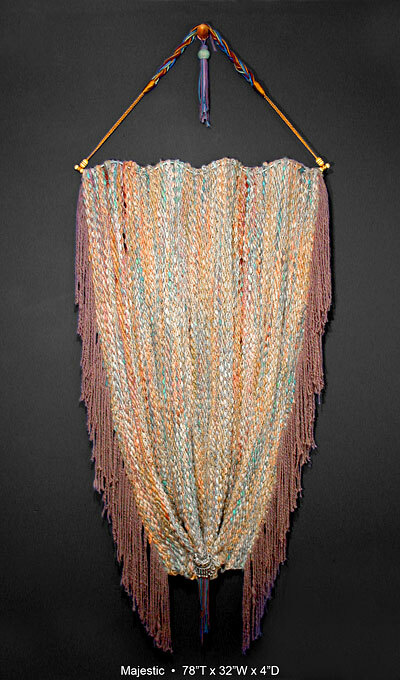 Each features a unique handwoven element conceived and created exclusively for the piece by fiber artist Kathy Kistner. 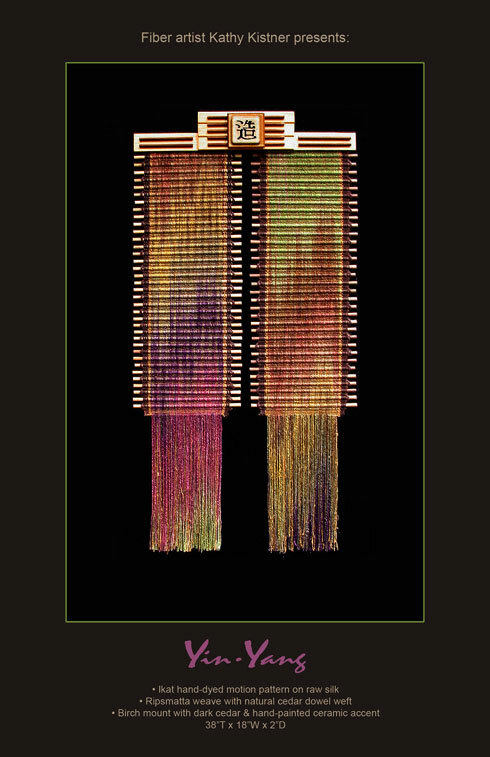 The original woven fiber work is created either on a floor loom, custom lap loom, or upright Navajo loom. Each is beautifully blended with specially selected upcycled components, which may include abandoned Couture remnants, reimagined cut scrap leathers or suede, chosen bindings from among luxurious mercerized cotton yarns, ultra-soft bamboo threades, stranded metallics, and plush wool windings. 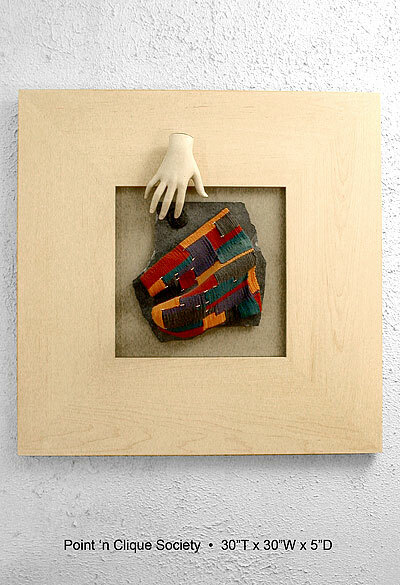 There may be other recycled elements as may enhance the final artwork. 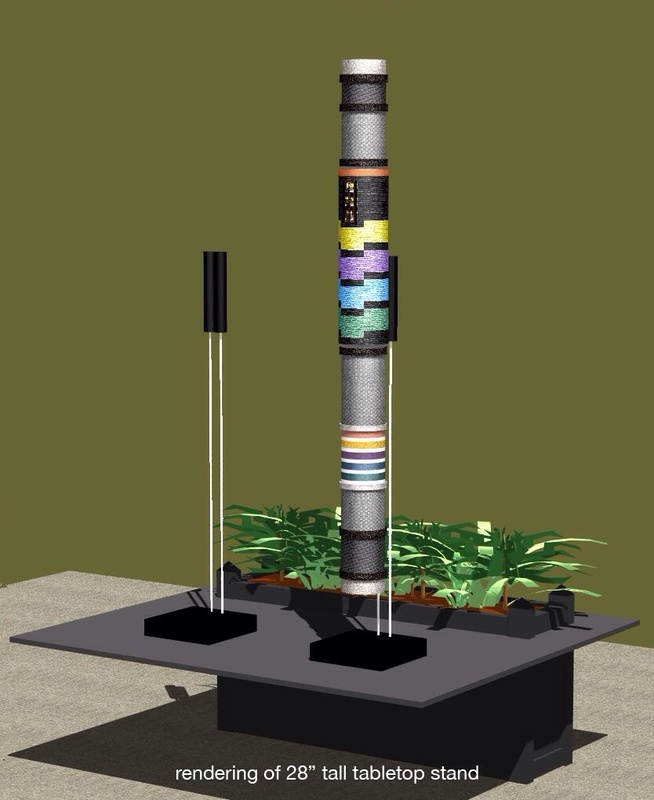 When the finished piece is ultimately envisioned, and all materials collected – the final build design is created by Rob Kistner on his MAC CAD design station. 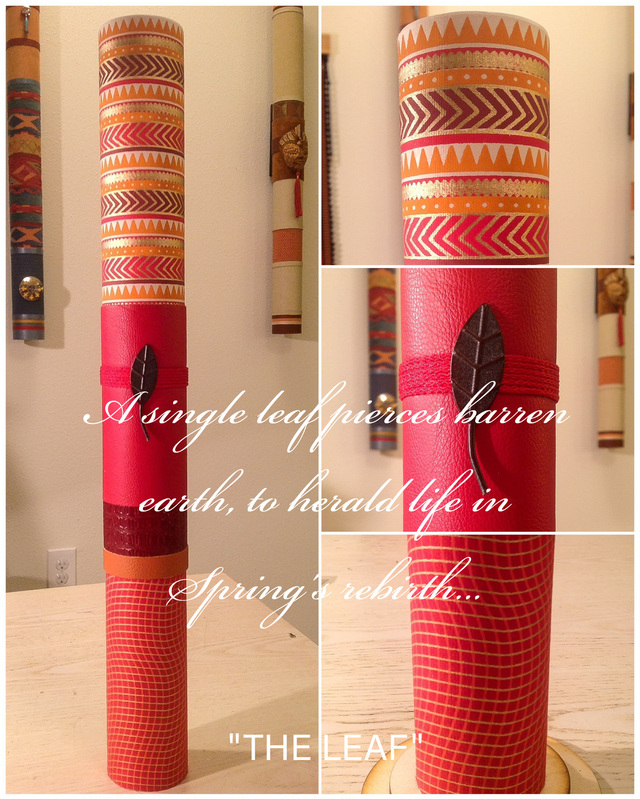 This garauntees a tight, accurate final fabrication, for a gorgeous high quality piece. The following Serenity Totem entitled “Deco” features a handwoven element of our creation. 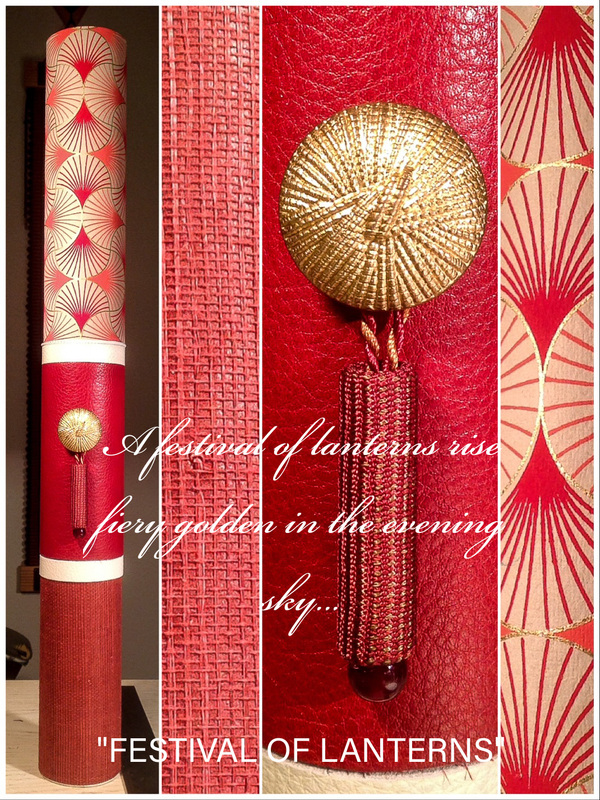 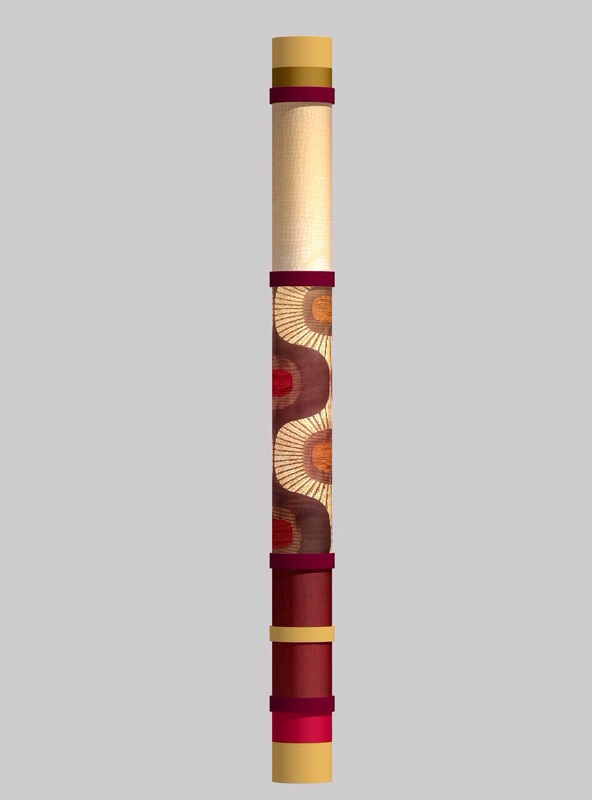 The following Serenity Totem entitled “Abstract in Scarlet” features a handwoven element of our creation. 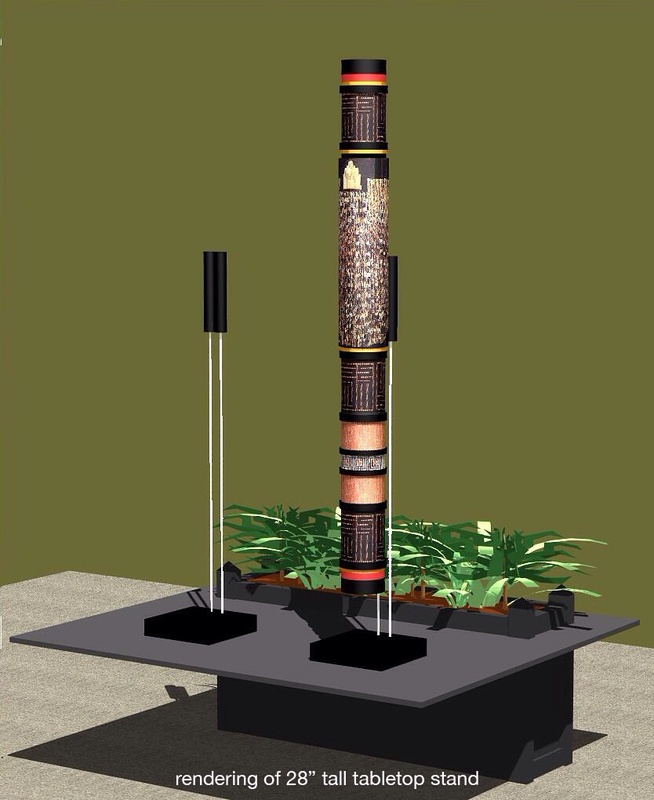 The following Serenity Totem entitled “Cascade” features a handwoven element of our creation. 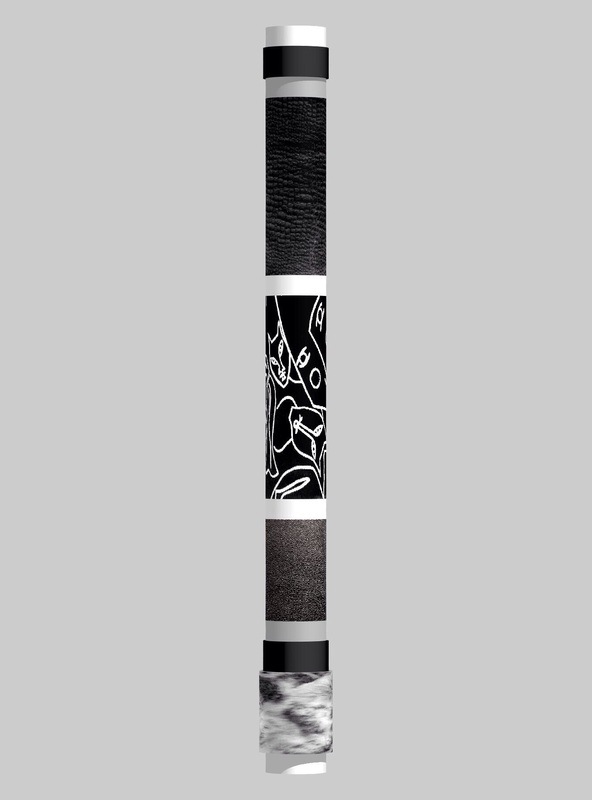 The following Serenity Totem entitled “Black Diamonds” features a handwoven element of our creation. The following Serenity Totem entitled “Santa Fe” features a handwoven element of our creation. 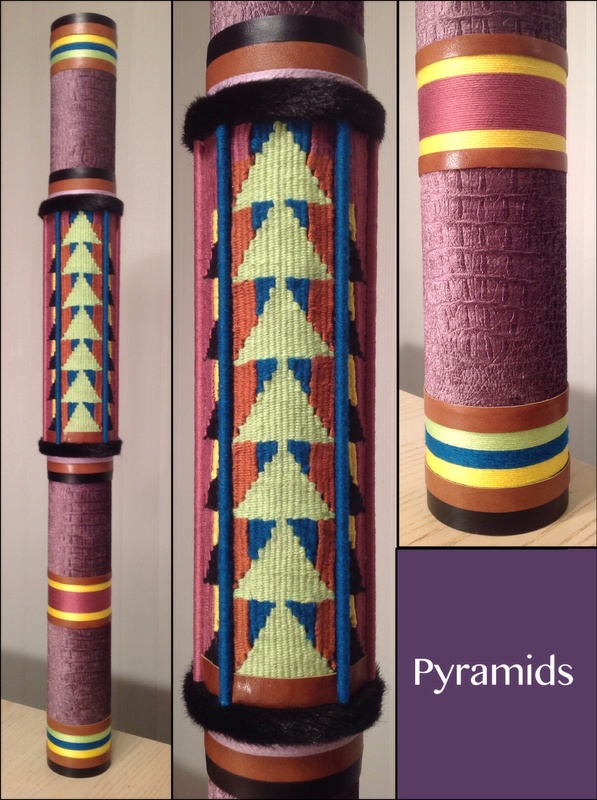 The following Serenity Totem entitled “Pyramids” features a handwoven element of our creation. 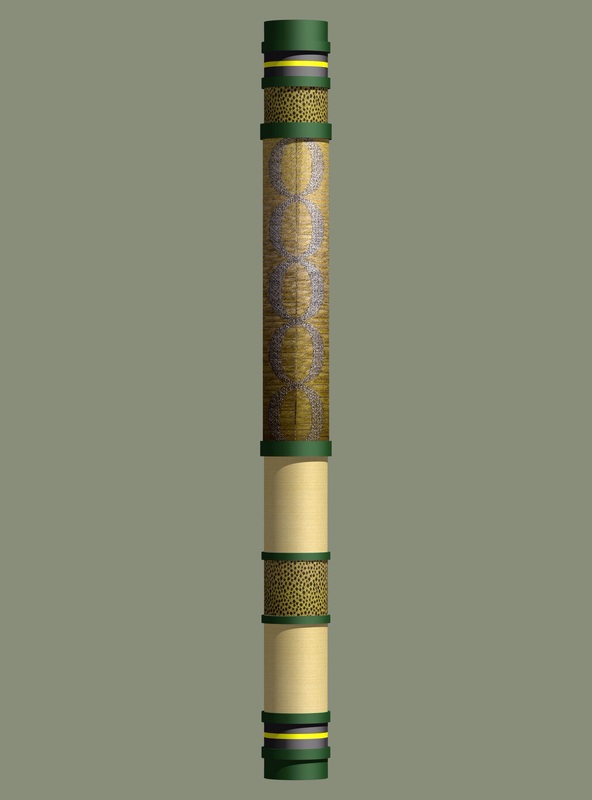 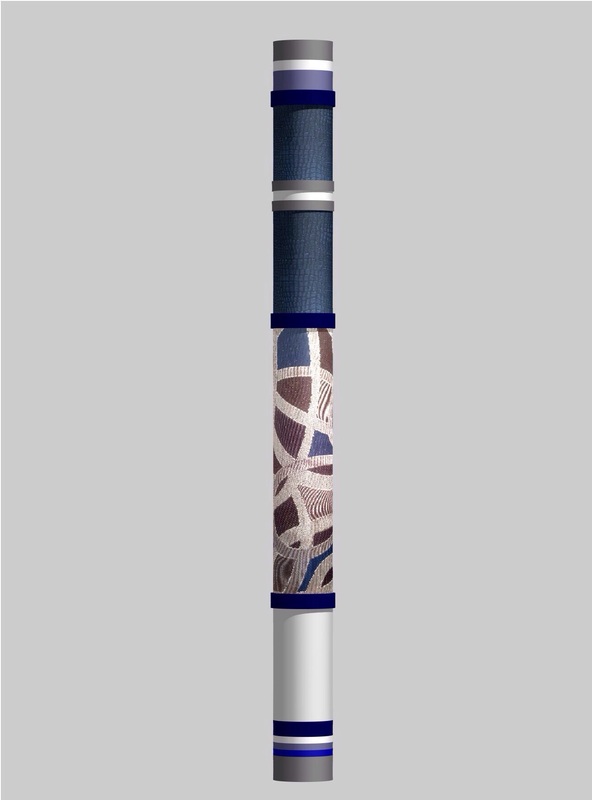 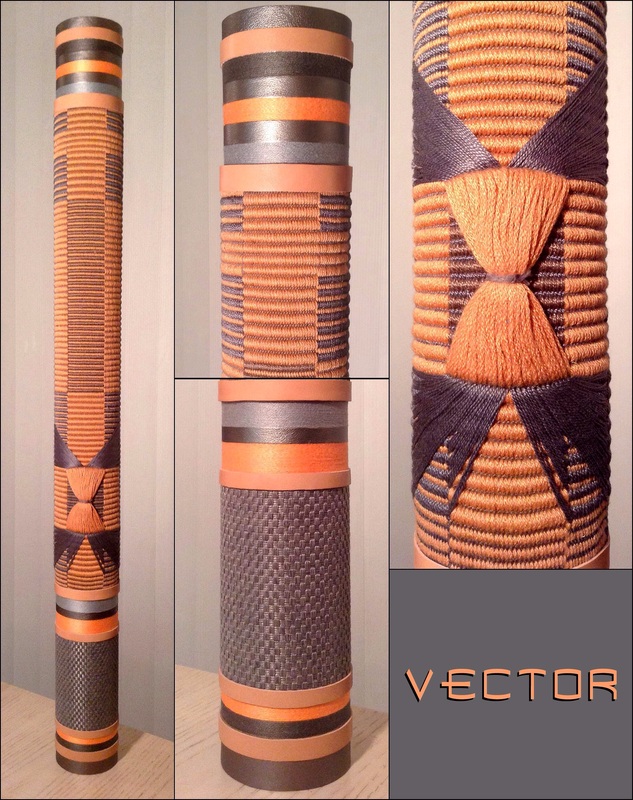 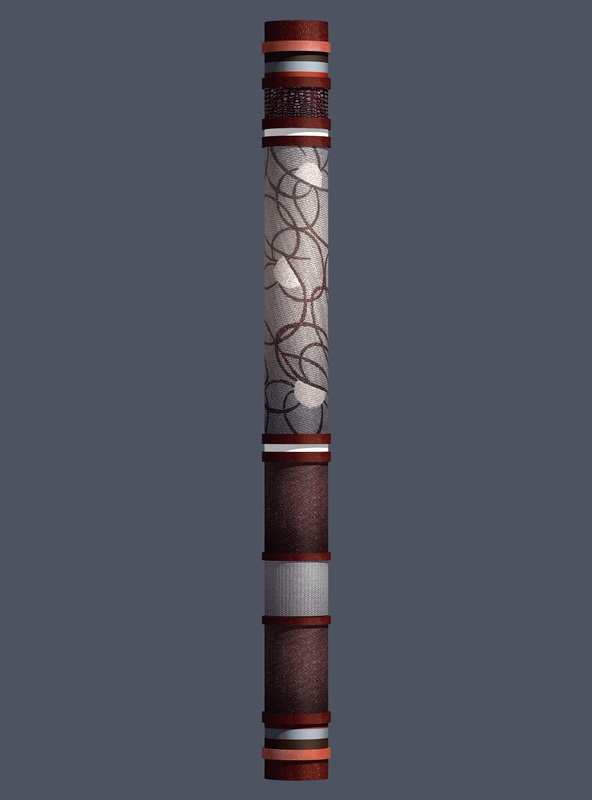 The following Serenity Totem entitled “Vector” features a handwoven element of our creation. 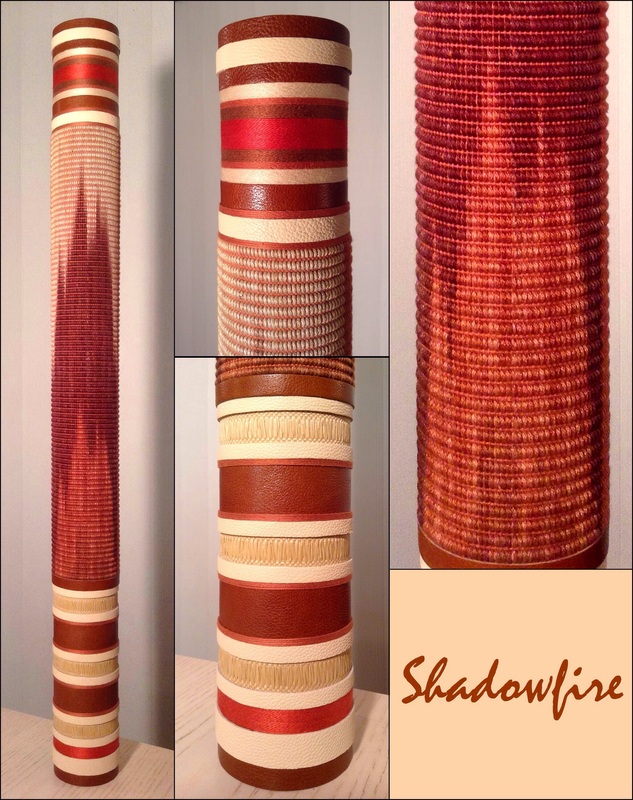 The following Serenity Totem entitled “Shadowfire” features a handwoven element of our creation. 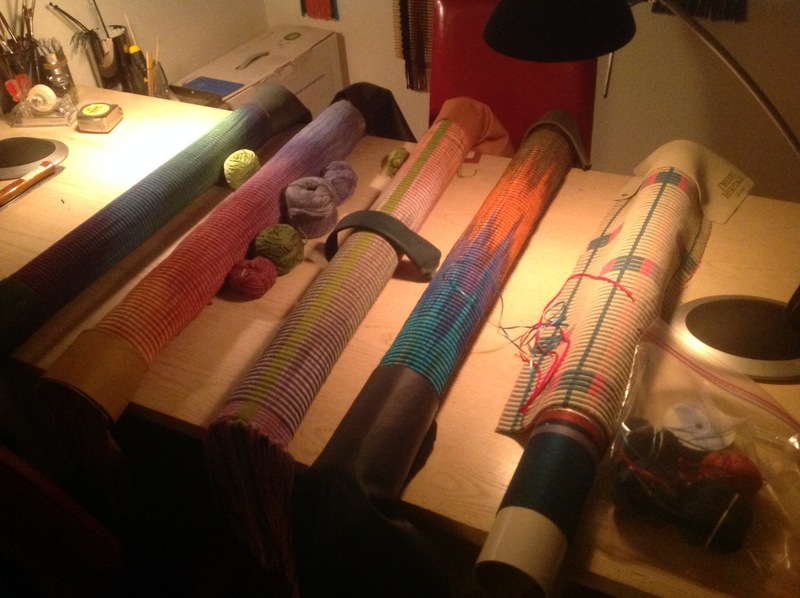 The two (2) pictures below are different perspectives of five (5) new one-of-a-kind Handwoven Serenity Totems being prepared for final creation. 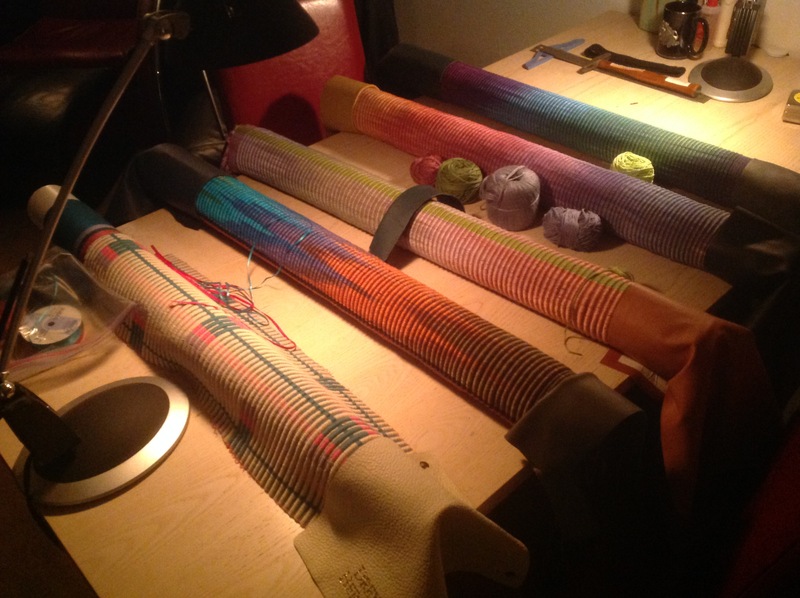 They will all feature original Rippsmatta weaves created by Kathy. Four (4) will feature Ikat hand dying in her signature motion pattern. Many more elements will need be measured, fit, cut and carefully applied before each piece will be finished. 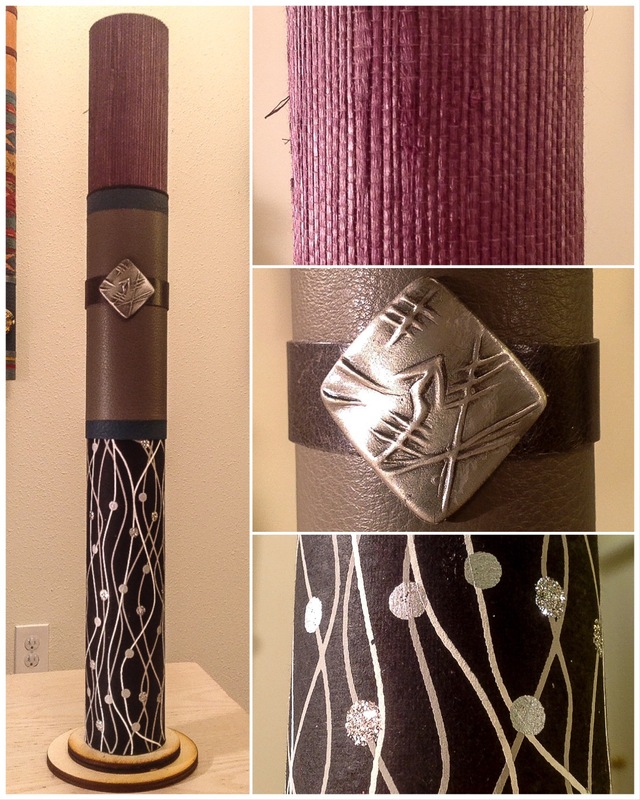 These elements can include leather, suede, mercerized windings, metalics, woods, couture remnants, acrylics, and a variety of other found, fabricated, and reclaimed components. The penultimate step will be to cut lacquer and fit color coordinated top and bottom pieces. 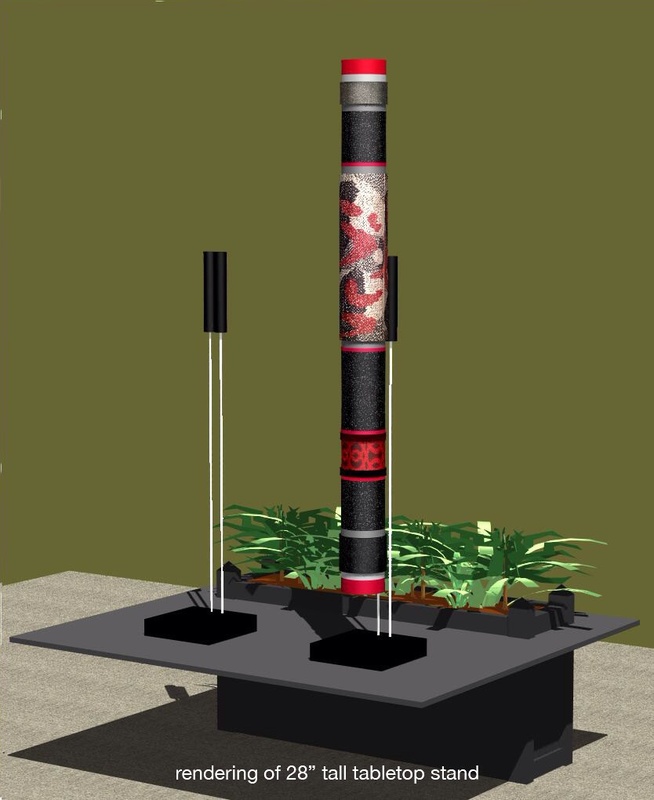 Then finally a mounting piece will be designed, fabricated, and affixed so the Serenity Totem can be beautifully displayed. 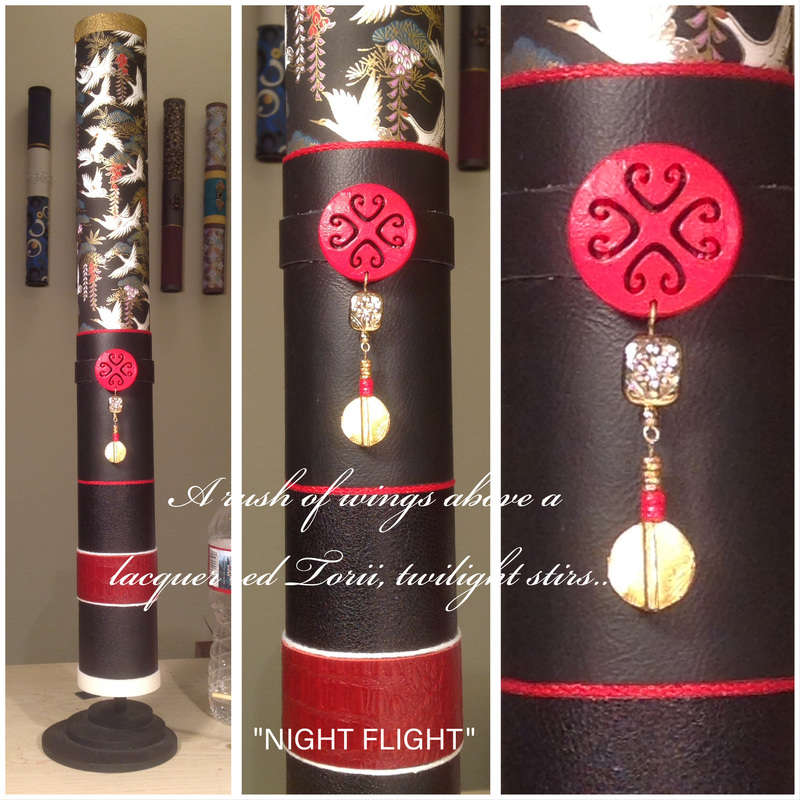 The following pieces are from our ‘Designer Ensemble’ Serenity Totem Series. 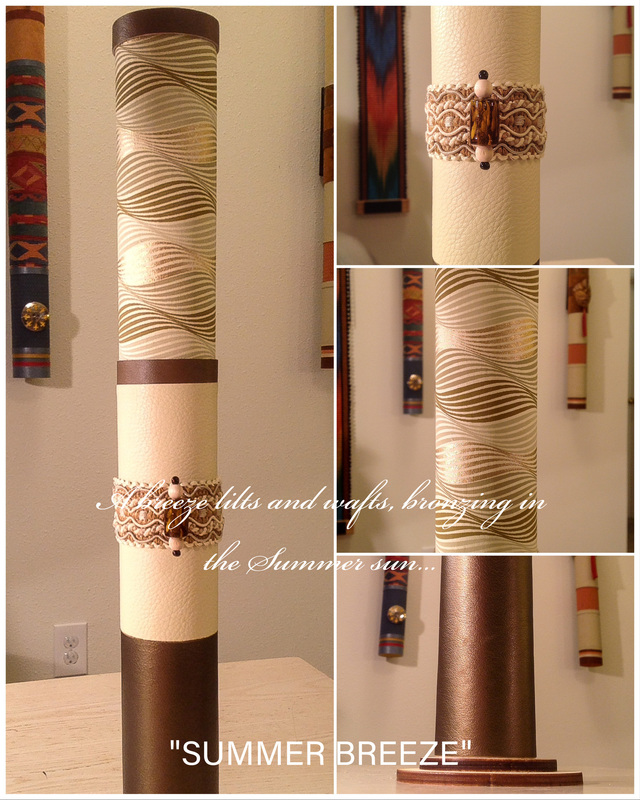 Each is a contemporary, one-of-a-kind, cylindrical, 3D, mixed-media fiberart sculpture. 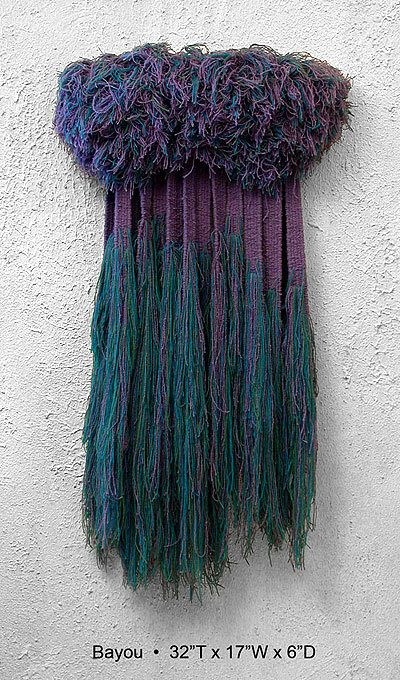 Each features a unique found object selected from the expansive treasure troth of rediscovered gems of fiber artist Kathy Kistner. 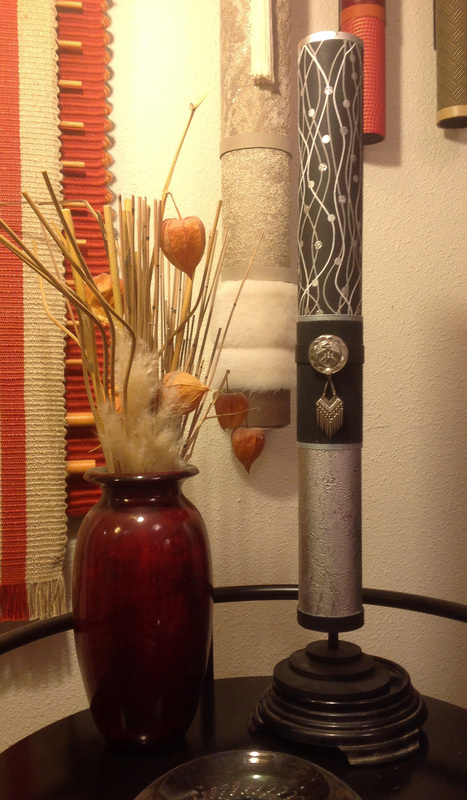 Kathy has built her massive collection of fascinating found objects over a quarter of a century of inspired hunting, served by her remarkable ability to see the beauty in life’s discarded. 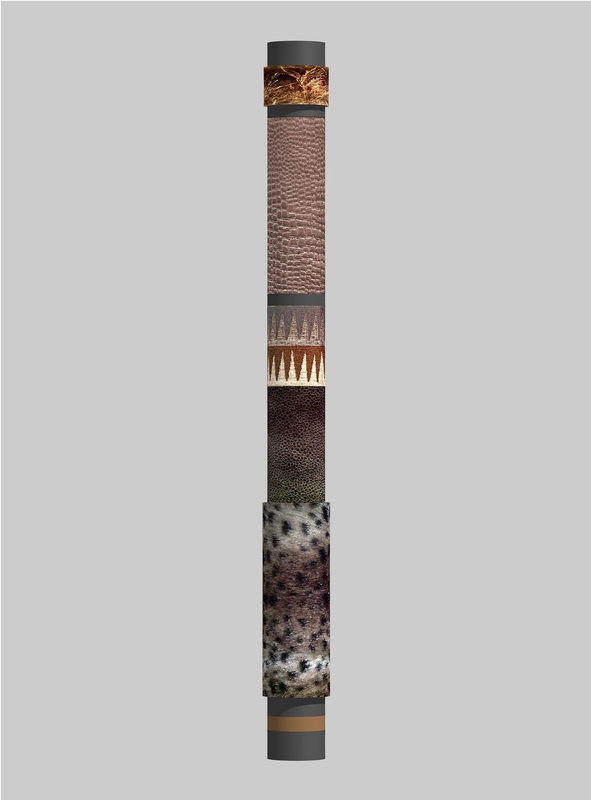 Each found object is exquisitely blended with specially selected upcycled components, which may include abandoned Couture remnants, reimagined cut scrap leathers or suede, chosen bindings from among luxurious mercerized cotton yarns, ultra-soft bamboo threades, stranded metallics, and plush wool windings. 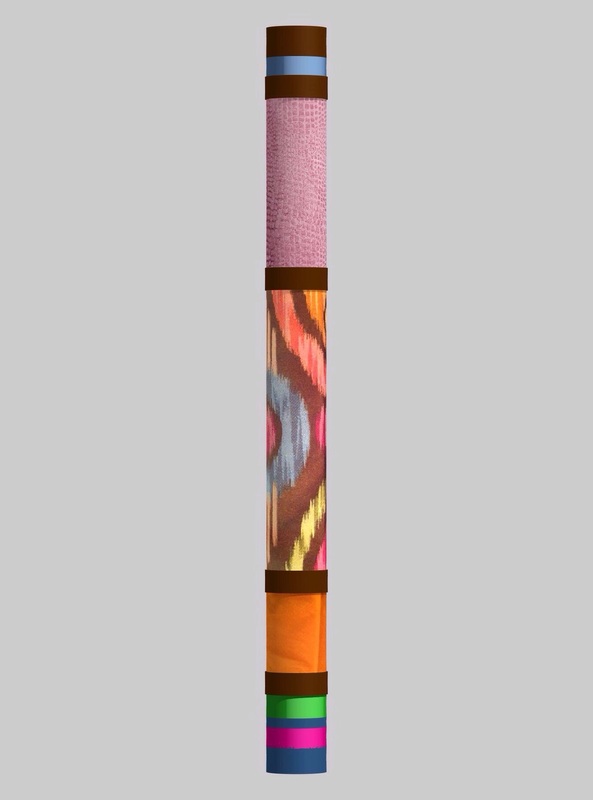 There may be other recycled elements as may enhance the final artwork. 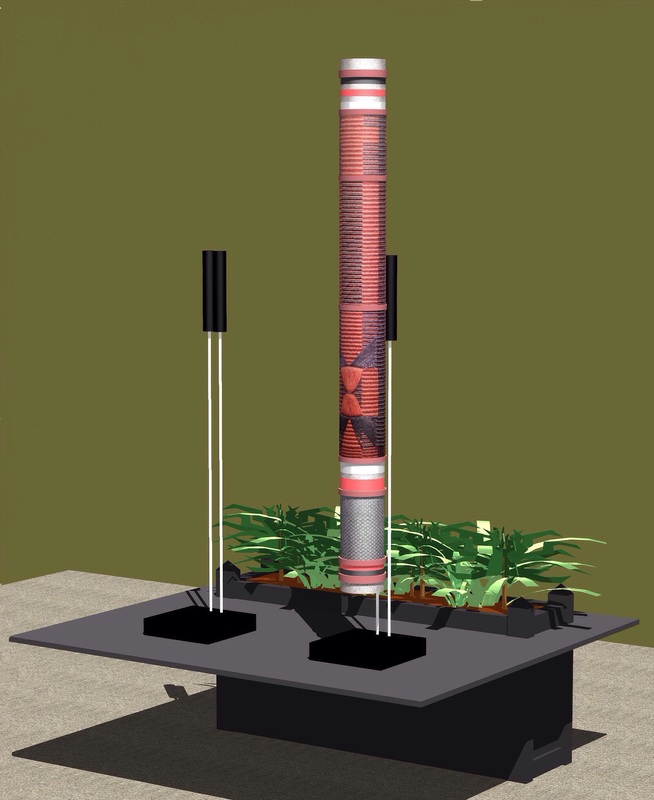 When the finished piece is ultimately envisioned, and all materials collected – the final build design is created by Rob Kistner on his MAC CAD design station. 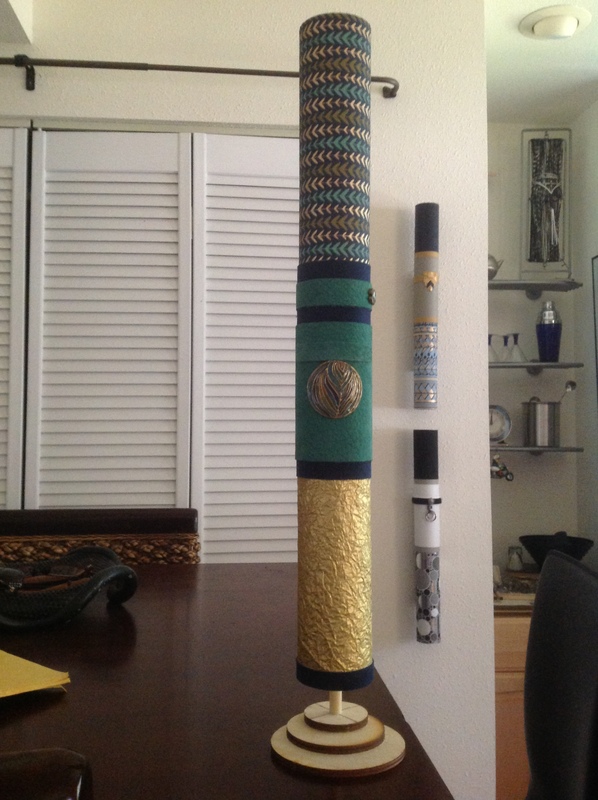 This garauntees a tight, accurate final fabrication, for a gorgeous high quality piece. 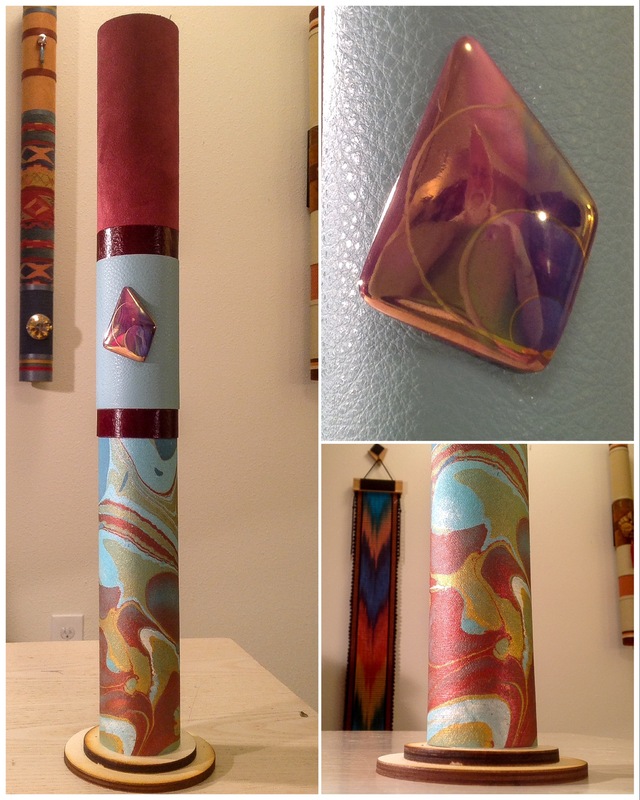 The following pieces are from our ‘Designer Prime’ Serenity Totem Series. 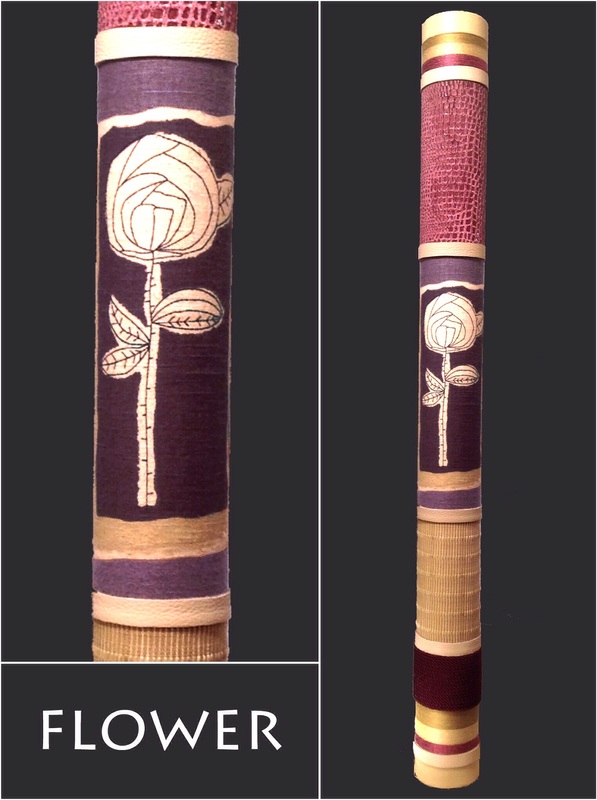 Each is a contemporary, one-of-a-kind, cylindrical, 3D, mixed-media fiberart sculpture. 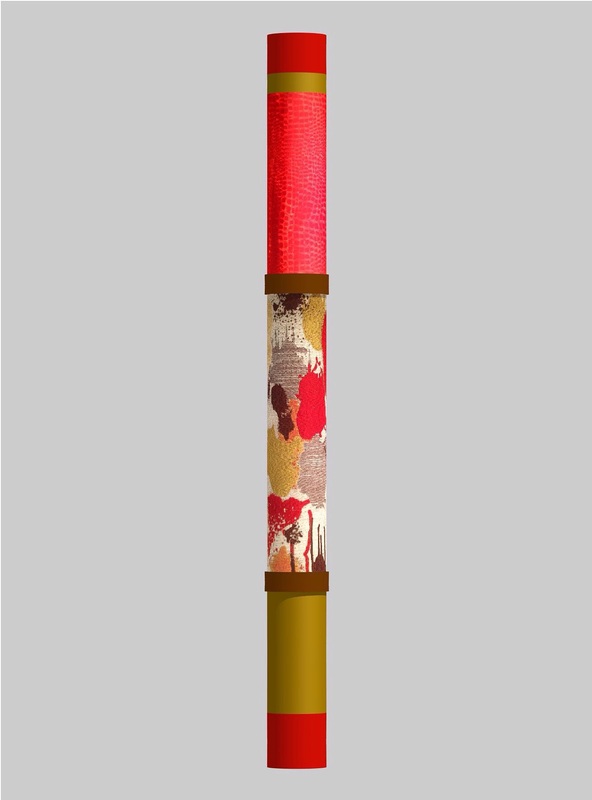 Each piece is conceived as a wholly original work and created by integrating specially selected upcycled components, which may include abandoned Couture remnants, reimagined cut scrap leathers or suedes, faux furs, chosen bindings from among luxurious mercerized cotton yarns, ultra-soft bamboo threades, stranded metallics, and plush wool windings. 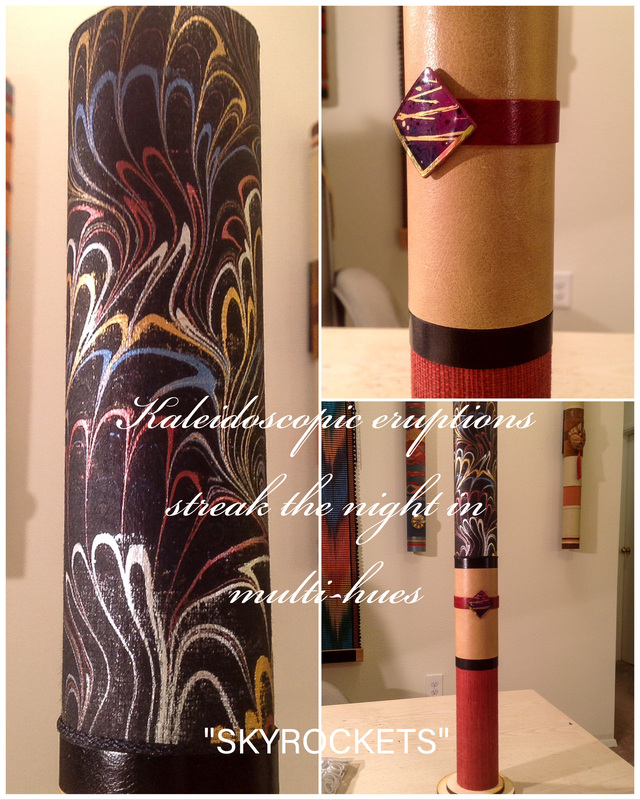 There may be other recycled elements as may enhance the final artwork. When the finished piece is ultimately envisioned, and all materials collected – the final build design is created by Rob Kistner on his MAC CAD design station. This garauntees a tight, accurate final fabrication, for a gorgeous high quality piece. *NOTE: Pieces can be wall mounted or displayed tabletop.